Copycat school shooting threats sweep nation following Nikolas Cruz mass shooting. Copycat school shooting threats sweep nation. Pictured, 14 year old, St. Petersburg, Florida, student, Edward Charles Osgood. Copycat school shooting threats sweep nation following Nikolas Cruz mass shooting. Up to a dozen students arrested in the days after last week’s Florida school mass shooting. Authorities have told of making arrests following at least a dozen copycat style threats across the US, less than a week after 17 died at a Parkland, Florida school shooting at the hands of 19 year old former student, Nikolas Cruz. 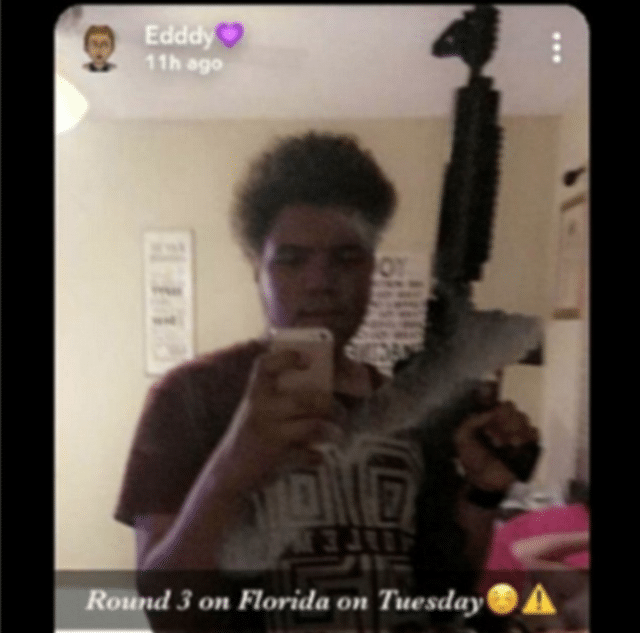 The Pinellas County Sheriffs Office told of 14 year old boy, Edward Charles Osgood being arrested following an alleged written note threatening to kill over the weekend in St. Petersburg, Florida. 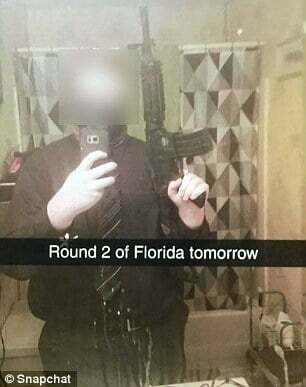 The caption included an image of Edward Osgood holding what appears to be a semi automatic rifle. 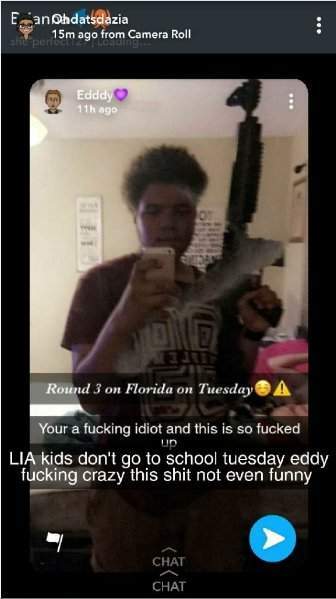 Students at Lealman Innovation Academy, which Osgood attends, reported the social media image to police, who rushed to interview the teen. ‘I know why you are here, because of the photo,’ Osgood told the Pinellas County deputies when they arrived, according to investigators. Osgood told officers he’d seen a recent Snapchat post of a masked man with a gun promising ‘Round 2 on Florida’ and thought it was ‘messed up’. A teen in Spartanburg, South Carolina was arrested for the ‘Round 2’ threat. 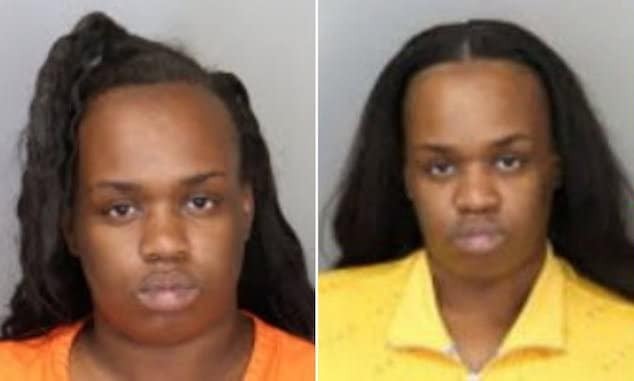 For reasons not necessarily understood, Osgood decided to pose with a friend’s AR-15 replica BB gun and make a similar post, according to cops. Police seized the BB gun from a friend’s house after Osgood was arrested at his parents’ house. Copycat school shooting threats sweep nation. Osgood says he was inspired by this ‘messed up’ image. The poster was also arrested. Copycat school shooting threats sweep nation: From North Carolina, Ohio, Kentucky and Virginia. 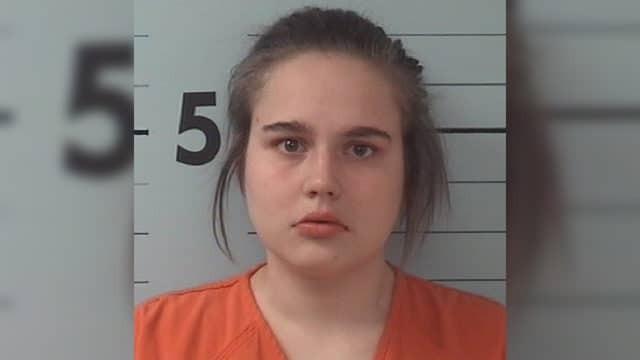 In Morganton, North Carolina, police arrested 17 year old student, Mackenzie Rae Swink at Patton High School, Monday morning following the student reporting alleged threats to ‘shoot up the school’. Upon her arrest, Swink was charged with making a false report concerning mass violence on educational property. 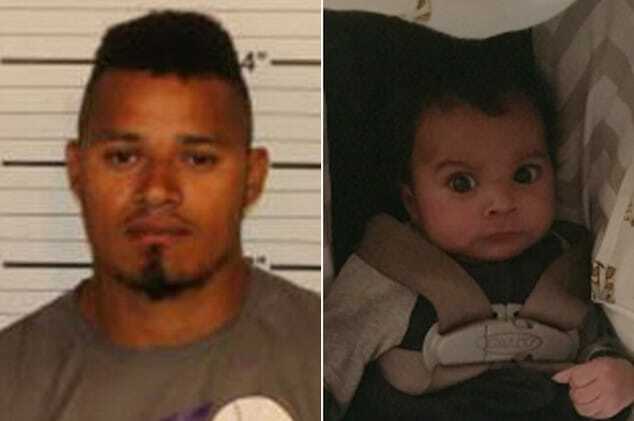 She is being held at the Burke-Catawba District Confinement Facility reported wsoctv. Bail was set at $50,000. Police in Toledo, Ohio said on Monday that Christian Costet, 19, had been arrested for allegedly threatening to ‘shoot up’ Waite High School. Cops recovered a replica rifle that Costed had allegedly posed with in photos. He was charged with inducing panic. Also on Monday, a 15-year-old girl was arrested for allegedly threatening to bomb Jackson County High School in eastern Kentucky. The dailymail reported the teen being charged with first-degree terroristic threatening and is being held in the Breathitt County Juvenile Detention Center. There she joins a 14-year-old boy who was charged with second degree terroristic threatening after allegedly making a social media threat against North Laurel Middle School on Saturday. Kentucky State Police have not identified either teen. In Norfolk, Virginia, a 14-year-old Lake Taylor Middle School student was arrested around 6.30am on Monday, after police responded to a tip about a social media post threatening to shoot other students. The seventh grader faces a Class 6 felony charge for making threats of death or bodily injury. Copycat school shooting threats sweep nation. Copycat school shooting threats sweep nation: From Florida, Texas, Louisiana, Iowa and Mississippi. 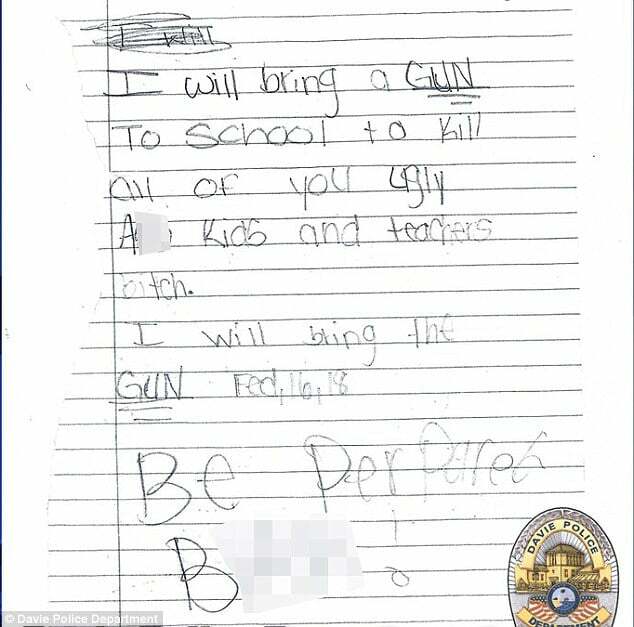 On Thursday, a girl in Davie, Florida aged just 11 wrote a terrifying threat note, police say. ‘I will bring a gun to school to kill all of you ugly a** kids and teachers b***h. I will bring the gun Feb, 16, 18. BE prepared b***h!” read the note slipped under the door of an assistant principal’s office. Cops say the girl confessed to writing the note after surveillance footage revealed her leaving it. She has been arrested. In Houston, Stevenson Middle School went on lockdown for about two hours on Monday after a threat on social media. A student was arrested off-campus and charged with making a terroristic threat. Elsewhere in Texas, police in El Paso said on Monday that they had arrested four suspects tied to a rash of school threats in recent days. Across the state line in Louisiana, students at Ville Platte High School were also put on lockdown on Monday, after a threat to the school was made on Instagram around 12am. A 15-year-old boy was arrested and charged in the matter, police say. In Indiana, at least 10 school districts have investigated either a real or rumored copycat threat since the Florida school shooting. 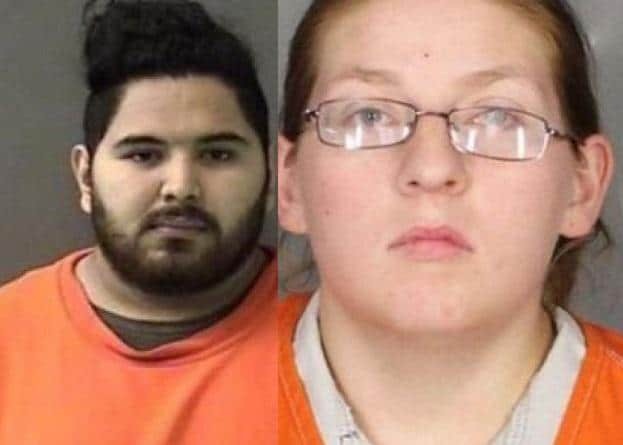 At least four people have been arrested in the state, and cops say more arrests could be coming. In Iowa, schools in the Southeast Warren Community School District were put on lockdown Monday and a juvenile was arrested over a threat of a school shooting. In Mississippi, a juvenile was arrested on Monday for allegedly making threats on Snapchat against Petal High School the day prior. It follows the arrests of two 16-year-old boys in north Mississippi on Saturday in Snapchat threats made against students at Olive Branch’s Center Hill High School. Over the weekend, a 13-year-old boy in Republic, Missouri was arrested after making a video threat to shoot up a school with an AK-47. The teen was charged with first-degree making a terrorist threat after sending the video to a friend via social media late on Friday evening, police said. The threat was not reported to cops until nearly a day later, on Saturday evening, the Republic Police Department said in a statement. The teen was arrested at 2.37am and transported to the Greene County Juvenile Detention Center. Cops said that the threat did not target a specific school. The boy was reportedly a student at Republic Middle School. 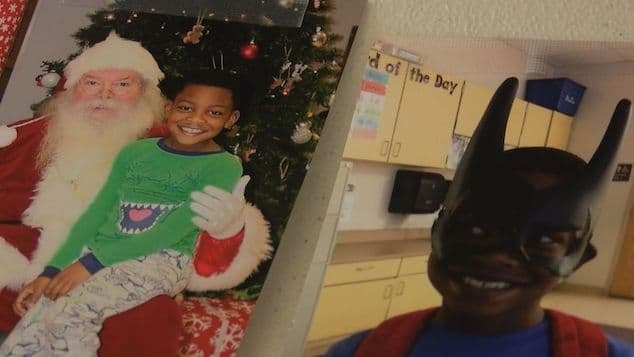 Police said guns and other evidence were seized during the search of the boy’s home, but did not reveal whether they recovered an AK-47. School was held as normal in Republic on Monday. The Republic Police Department reminded the public to communicate any threats promptly. ‘It is important for students and parents to immediately report threats like this to law enforcement so a proper investigation can be conducted,’ the department said. 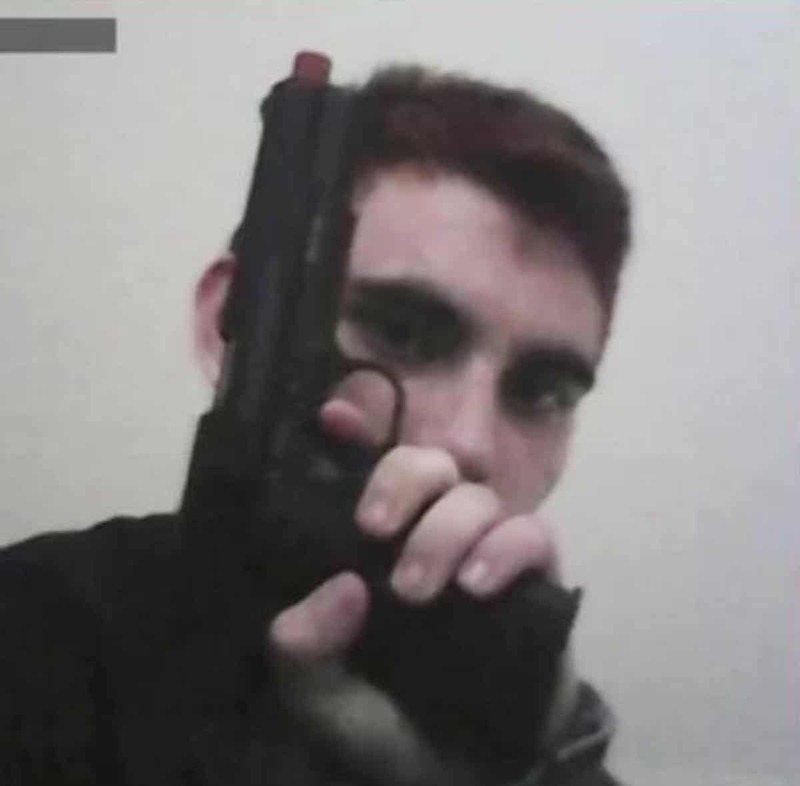 Nickolas Cruz mass school shooter. Image via Instagram.